Greg Gopman Facebook post: homeless ruining San Francisco, should be segregated from rich techies. 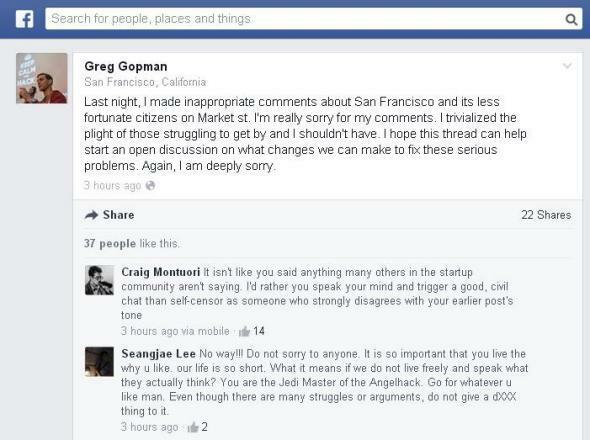 Greg Gopman apologized for comparing homeless people to “hyenas,” but some of his Facebook friends didn’t see anything wrong with his comments. San Francisco’s class war is getting ugly. Earlier this week, we had an alleged Google employee obnoxiously telling working-class people they don’t belong in San Francisco. But his rant seemed too perfectly stereotypical to be real—and it was. The “obnoxious Google employee” turned out to be an obnoxious union organizer trying to make Google look bad as part of an anti-gentrification protest. Now comes a Facebook post from a noted San Francisco techie that is, if anything, even more over-the-top than the fake Google guy’s tirade. The crazy part is, it actually seems to be real. And the even crazier part is, all of his Facebook friends seem to agree with it. Why the heart of our city has to be overrun by crazy, homeless, drug dealers, dropouts, and trash I have no clue. It’s one thing to come across as naïve and condescending as part of an otherwise generally earnest attempt to help a homeless person improve his situation. It’s another to treat them as so much trash, to be swept up and shipped out along with the rest of the city’s refuse. The sentiments are so risibly retrograde that, were they uttered by some mustachioed baron on Downton Abbey, you’d worry that the show’s writers were getting lazy, falling back on hackneyed stereotypes of villainous aristocrats. They wouldn’t sound out of place coming from the lips of Billy Zane’s character in Titanic, or the bigot Tom Buchanan in The Great Gatsby. And yet, unless there has been some truly elaborate hoax, it seems that Gopman actually wrote those words—he apologized for them today on Twitter and Facebook. But wait—Gopman’s friends aren’t having it! Below his Facebook apology post are a series of comments from fellow techies defending Gopman’s original homeless-phobic rant. One friend said he was glad Gopman spoke his mind, because even though he disagreed with the post’s tone, “It isn’t like you said anything many others in the startup community aren’t saying.” His comment had 14 likes at last check. “No way!!! Do not sorry to anyone,” added another Facebook friend. “I don’t think you need to apologize for anything,” agreed a third. Gopman’s view on the poor—that they have no value as human beings and should be segregated from the rest of society—is, I trust, not shared by a majority of techies in San Francisco, or anywhere else. Nor are a series of similarly contemptuous comments made a few months ago by fellow San Francisco entrepreneur Peter Shih. But the comments on Gopman’s Facebook page make it clear that this is not a case of a few bad seeds giving everyone else a bad name. There is clearly a real strain in the tech world that views poor people with pure contempt, like bugs in a computer program. The tech world is not alone in this, of course—you could probably overhear similar musings at a bar frequented by Wall Street bankers, or certain low-level Republican politicians. But it would be nice to think that there’s still hope for tomorrow’s masters of the universe—the Googlers, the startup founders, the venture capitalists—to turn out to be a little less evil than the crop that came before them. They could start by speaking up the next time one of their techie friends compares homeless people to hyenas, instead of reaching for the like button. Protesters Surround Google Bus in San Francisco. Obnoxiousness Ensues.